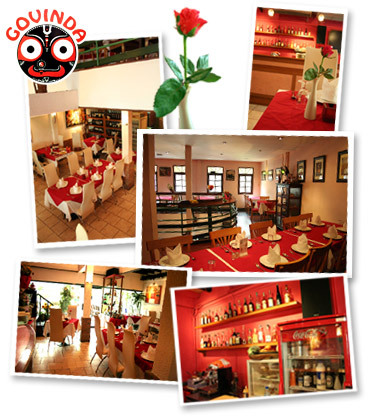 Govinda is a classic vegetarian Italian style restaurant situated in the heart of Bangkok . 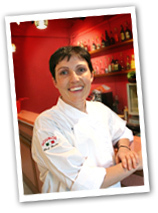 Your host, Khun Stefano welcomes you to dine in this beautiful restaurant. Set over 2 floors the red and white decoration creates a warm, friendly atmosphere; ideal for couples, or for entertaining friends and family. The Italian cuisine is delicious and reasonably priced. 1. Spaghetti Carbonara : Created from Italian imported spaghetti and cooked with � SPA foods� Veggie Belly . Served hot this dish smells delicious and tastes outstanding. 2. 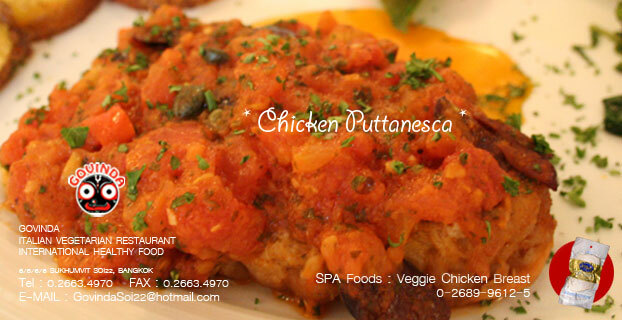 Chicken Puttanesca : Made from � SPA Foods � Chicken Breast. Oven cooked with sour sauce, olives and tomatoes; served with potatoes and spinach. Savour the smooth taste of �SPA Foods� chicken. 3. Sausage with mushroom sauce : "J.V. sausage" oven cooked with mushroom sauce and decorated with spices. A tasty treat!